Bossard, L. Building peace in the Sahel: A regional perspective. GREAT insights Magazine, Volume 4, Issue 1. December 2014/January 2015. For this reason, the regional dimension must be placed at the centre of the reflection and dialogue in order to make sure that one day it will also be at the centre of action. 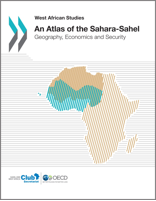 With that in mind, the Sahel and West Africa Club Secretariat (SWAC/OECD) has produced an “Atlas of the Sahara-Sahel”; (4) this article presents some of the key findings. No one would question that the Sahel problem currently at the centre of intense international attention is, in reality, a Sahara-Sahelian problem. The tragedy of the droughts of the 1970s and 1980s was strictly confined to the Sahel. However, the disturbances and terrorism that have since developed in the area have now extended to the Sahara and other parts of Africa. Yet dialogue and co-operation among the countries on both sides of the desert are at an embryonic stage and have produced very few concrete outcomes. Indeed, genuine trans-Saharan co-operation faces many obstacles. Firstly, we could mention the still deep animosity between Morocco and Algeria over the Western Sahara issue. Resolving this latent conflict is likely a pre-requisite for long-term stabilisation of the Sahara-Sahel. Secondly, the complexity of the institutional landscape is a major factor. No regional organisation, whether the African Union, the Arab Maghreb Union, the Community of Sahel-Saharan States or the Economic Community of West African States, represents all of the countries concerned. Shared by at least eight countries (Algeria, Chad, Libya, Mali, Mauritania, Morocco, Niger and Tunisia), this area is still too often perceived as the northern extremity of West Africa and the southern extremity of North Africa, (5) while in fact, it forms the centre of a macro-region extending from the Mediterranean coast to the Gulf of Guinea. This macro-regional scale must be incorporated into a long-term geopolitical strategy regardless of whether or not the immediate problems (the chaos in Libya, for example) seem insurmountable. A macro-regional approach obliges to think in long-term timeframes. While the most striking features of this “centre” may be its “vastness in space” and its 17,000 km of “porous” borders, space and territory have little meaning for the residents of the Sahara-Sahel. History shows that the influence of the different Sahel empires (Kanem, Ghana, Mali, Songhay and others) varied according to the routes (or trails) they built or conquered. Ultimately, the empty space between the routes was of no importance. This heritage remains today. Routes are the vectors of a mobile space inhabited by mobile societies organised more around networks than States. In his introduction to the Atlas, Denis Retaillé, Professor of Geography at the University of Bordeaux/CNRS, asks the following question: “How can we invent a legitimate area that conforms to the spatial realities of mobile societies?” This question is addressed to political leaders such as decision-makers responsible for developing “Sahel Strategies” or Malian negotiators operating in Algiers. In another part of the world, in an area encompassing parts of Sweden, Finland and Norway, the nomadic Sami people were granted special rights to fish, hunt and live their lives unconcerned by borders in 1971. However, comparisons can be misleading. Terrorist groups and criminal networks use the operating modes and expertise of nomads. Why should we accept that mobility is confiscated by these groups? Regional and international organisations have the ability, in dialogue with national governments, to overstep the confines of a territory and closed borders. In other words, mobile threats call for mobile solutions. 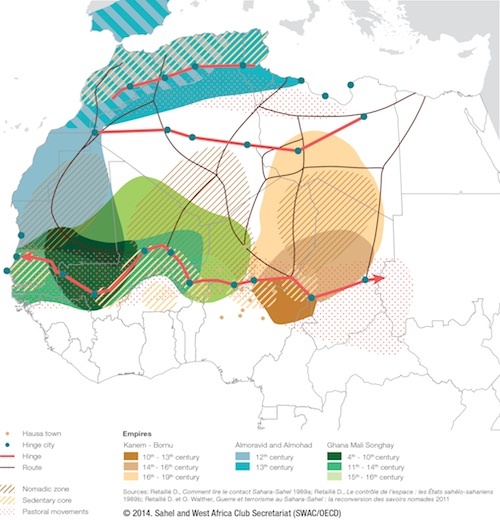 Does the Sahara-Sahel “centre” have any development potential? What could help foster economic growth in order to stabilise the area and protect its children from the temptations of trafficking and the risks of violence? These questions are key to the “Sahel Strategies”. Clearly, there are and will be only few drivers of growth in the Sahara-Sahel compared to the vibrant coastal areas. However, perhaps the question needs to be reframed. We must stop asking how the countries and regions concerned can manage these vast “low-potential areas” but start thinking about the role these areas can play in the macro-regional development. After all, the current situation recalls that instability in the Sahara-Sahel threatens the security and therefore the development of half of the African continent on both sides of the desert. Ensuring stability in the Sahara-Sahel also means creating the conditions for the future development of a large portion of the continent. Consequently, this approach requires changing the methods used to calculate the cost-effectiveness of infrastructure in sparsely populated areas which must also take into account the cost of territorial management. Building a few hundred kilometres of road not only helps develop trade between Algiers and Lagos, it also facilitates transportation within the desert. 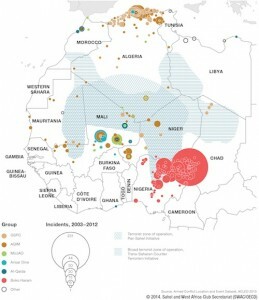 Nevertheless, a negative view of the Sahara-Sahel still dominates. This view is predicated on the following observations and beliefs: 1) Sahara-Sahel has limited potential apart from a few mining deposits; 2) it is sparsely populated and the area is thus destined to remain “on the margins of African economic development”; 3) irredentism is a chronic problem, the area is structurally difficult to control; infrastructure development is costly and likely to suffer from environmental deterioration. The strategy associated with such a vision of the future is compelled to limit its focus on security issues, control, territorial management and maybe some social development projects at the local level. On the other hand, a more ambitious, integrated approach is feasible under a different vision that accepts to integrate a long-term perspective. This approach sees the central Sahara-Sahelian areas as connected, useful, shared, fluid and peaceful yet still fragile. Such a vision rejects the notion of marginalised areas with no future. It gives (back) these territories a role based on local assets. It assumes intense trans-Saharan co-operation that, although appearing somewhat unrealistic today, should nonetheless be the compass that guides our actions. Laurent Bossard is the Director of the Sahel and West Africa Club Secretariat (SWAC/OECD). 1. The European Union’s Strategy for Security and Development in the Sahel (2011); Mauritania’s National Strategy to Combat Terrorism and Transnational Organised Crime (2012); the Strategy for Security and Development in the Sahel-Saharan Areas of Niger (2012); the Plan for the Sustainable Revival of Mali (2013); the United Nations Integratd Strategy for the Sahel (2013); the African Union Strategy for the Sahel Region (2014); the ECOWAS Strategy for the Sahel (2014); and the Sahel G5 Investment Priorities Plan (2014). 2. Strategy for Security and Development in the Sahel (EU): “The problems in the Sahel are cross-border and closely intertwined. Only a regional, integrated and holistic strategy will enable us to make progress on any of the specific problems. […] The security threats in the Sahel […] as well as their solution – are of a transnational nature […]. 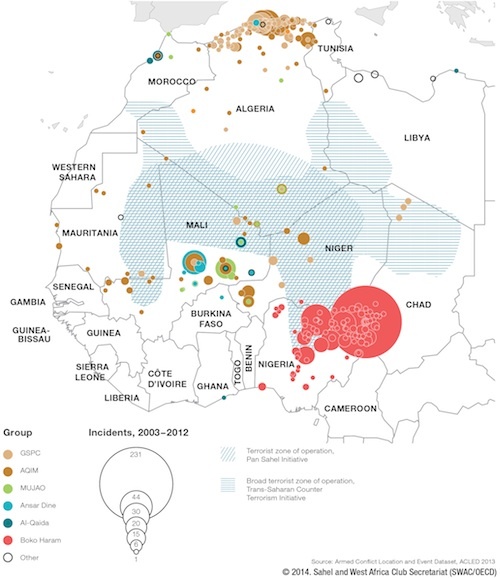 The sometimes differing perception of the threats and solutions by the three Sahel States and their three Maghreb neighbours (Algeria, Libya and Morocco) and the absence of a sub-regional organisation encompassing all the Sahel and Maghreb states, lead to unilateral or poorly coordinated action […].”. 3. United Nations Integrated Strategy for the Sahel: “The challenges facing the Sahel do not respect borders and neither can the solutions. […] A number of worthy initiatives have suffered from inadequate coordination and have failed to take into account the broader regional dimensions of the problem, partly owing to lack of trust, lack of effective regional instruments or lack of information”. 4. OECD/SWAC. 2014. An Atlas of the Sahara-Sahel: Geography, Economics and Security, West African Studies, OECD Publishing, Paris. OECD, ADB, UNDP, AEC (2014), “African Economic Outlook.” OECD/ADB/UNDP (2014), African Economic Outlook 2014: Global Value Chains and Africa’s Industrialisation, OECD Publishing. 5. North African countries have certainly made significant investments in their southern desert region. However, these policies were intended to encourage people to move to the Mediterranean coast rather than connect these areas with Sub-Saharan Africa. This article has been translated from the original French version.